Not long ago, in 2008, the Borough of Lansdale, Pennsylvania, a suburb of Philadelphia, opened a new park. Now, Lansdale was already awash in parks, but this one is special in that it has a magnificent nature trail meandering through dense woodland. Stony Creek Park, as it is called, is a real treat in such a highly urbanized area. It is, in my opinion, the nearest thing to Heaven that you'll find in Lansdale. Click on map to enlarge. Numbers on the map correspond to numbers in the text. A good appreciation of this amenity begins with a stroll of about a mile, level all the way. Starting at the parking lot (1) it follows a paved trail parallel to Hancock Street past a large pond (2) with a fountain and a statue (below) of three children fishing. The pond’s perimeter features native vegetation, various little wildlife, and geese. As the trail curves to the right, leave it and follow the sidewalk on Hancock Street to the Nature Trail entrance (3). If it’s a hot day you’ll immediately notice welcome relief under a golden canopy of moist leaves. I’ve walked here even in 95º weather and remained comfortable. The dense foliage, at times radiating in arboreal splendor, is especially nice on a sunny day during the Fall Foliage season. A perfect musical accompaniment to this walk, if you happen to be carrying an audio device, is Forest Murmurs from Wagner's opera Siegfried. Another good choice would be Debussy's Prelude to the Afternoon of a Faun. You’ll soon pass over an elevated wooden walkway protecting your feet from a short patch of soggy ground, then a wooden bench beside the crushed-stone trail. Turn left at the intersection (4), where there is another bench, and continue over another elevated walkway. The trail meanders around quite a bit through the Woodland area, then turns right to a second intersection (5). Whoever designed this trail clearly understood the visual impact of the S-curve, a basic concept in both painting and photography. This place is full of them. While again exploring that hidden path today (Sept. 7, 2010) I noticed a large lean-to in the clearing, recently made of fallen branches. Some adventurous kids must have been building their "fort," just as we did 70 years ago! Hooray for them! The active rail line just ahead now carries freight only, but prior to 1951 was the route of the Liberty Bell Limited, an interurban trolley car that ran from Allentown to Philadelphia. Return to the intersection (5) and turn left. After curving around quite a bit among mature trees and dense forest, the trail enters its Wetlands stage. At this point it becomes an elevated wooden walkway (photo, above) for quite a distance, wandering around above tiny rivulets that come to life after a heavy rain. Back on dry land, you’ll notice several small clearings between the tall, old trees. This scene just cries out for a gingerbread house, complete with Hänsel und Gretel and the Wicked Witch of Grimm’s fairy tale and Humperdinck’s opera. After the second sharp bend to the right following the wooden walkway a well-defined path leads off to the left and deep into the woods. The earth here is quite eroded from heavy rains, with a great many tree roots exposed. Again, this is a great place for kids to hide. Turn left at the next intersection (7) and enter the treeless Meadows section of the trail. Here you can walk in the sun, soaking up Vitamin D to strengthen your bones. There’s both a bench and an explanatory sign along the way, but keep an eye out for bees! Here the Nature Trail ends as you step into the park proper. An overview of the entire park can be enjoyed from the top of a small rise (8), reached by a curving path to the right. After the exhausting 14-foot climb to the top you’ll be happy to see a bench, and for the curious a binocular gadget mounted on a pole. Below this is an enclosed playground (9) for very young kids, with all sorts of safe activities in a naturalistic environment sure to engage children’s vivid imaginations. The Pavilion (10) (photo, above) is a nice, shady place for an alfresco lunch, with both sheltered and open picnic benches provided along with two grills. It may be reserved for private affairs by contacting the Parks Department (link below), but most of the time is open to the general public. There is a convenient drinking fountain just outside the structure. Finally, a most unusual and enlightening feature. The Labyrinth (11) reflects both the spiritual and philosophical aspects of medieval thought. The original design dates to around 400 BC and became widely used during the Middle Ages. Symbolically, it represents a single path to a deity in a clearly defined center reached from only one entrance, often thought of as birth. As well as spiritual salvation, that center goal can also be enlightenment. Meandering along the twists and turns causes a loss of direction and a sense of the outer world, thus quieting the mind. Or so they say. Here’s a satellite view (above) of the Stony Creek Labyrinth. See if you can follow the route to the rock in its center. It’s tricky. And here's a view from inside the labyrinth (below). One day while walking along the Woodland section of the trail I saw a deer — a fawn, really — standing in the path watching me. As I resumed walking it scampered off into the woods. Encounters like this enhance the experience of being in a natural environment, yet so close to busy urban life. Other wildlife includes rabbits, squirrels, and of course mosquitoes. For the latter it is wise to use a spray deterrent before setting out. Lastly, I once got stung by a bee in the neck, back in the Meadows area next to the sign explaining how bees pollinate the plant life. Please leave the Nature Trail as it is. Don’t make it pretty. Remove only the fallen trees that actually cross the trail. Let Mother Nature do Her own thing. And please replace the missing shrubs in the labyrinth. That is all. Thank you. Hancock Street is only two lanes wide and is extremely busy in both directions during rush hours. Exiting the park, those making a left turn may have a long wait for a break in traffic. It may be easier to make a right turn, then a left at Church Road. Pending construction of proper restroom facilities there is a porta-potty outhouse in the parking lot. Be sure to use bug spray if you’re walking on the Nature Trail during summer. Mosquitoes abound. There are two free dispensers of plastic dog waste bags, one by the parking lot and the other at the Hancock Street trail entrance. Stony Creek Park is part of the proposed Liberty Bell Trail, a string of parks and trails following the route taken by America’s Liberty Bell in 1777 as it was spirited off to a safe hiding place in Allentown during the Revolutionary War. Only a few of these parks have opened as yet, but more are on the way. It also closely follows the route of the former Liberty Bell Limited, an interurban trolley car that connected Allentown with Philadelphia from around 1900 until 1951. As a child, I used to ride this back in the 1930s and '40s. Starting from a depot at 8th and Hamilton streets in Allentown, it crossed a long bridge over the Little Lehigh, then followed old route 309 (now 145) across South Mountain and down into Quakertown, Sellersville, Telford, Souderton, Hatfield, Lansdale (where it stopped across the street from the present SEPTA train station), West Point, East Norriton, Norristown, and down into Philadelphia. These images are/will be copyrighted and available for use by others only with my permission. Non-commercial use will be free as long as attribution or a link to this blog is made; commercial use may require a fee. Nearly all of the photos are/will be available from me in high definition jpeg files suitable for reproduction. Here's the lean-to I mentioned above. Thurs., Sept. 9, 2010, 10:15 am. This morning there were "working on the railroad" sounds coming from the freight line west of the park. I followed these around to the abandoned rail line (6) and turned right. Up there a CSX crew was busy servicing their line with a strange device mounted on a truck that ran on both rails and roads. Returning to the intersection (5) I was startled when what I swear was a coyote (or maybe a fox) darted out from the woods, crossed the trail, and dashed into the dense underbrush to the east. 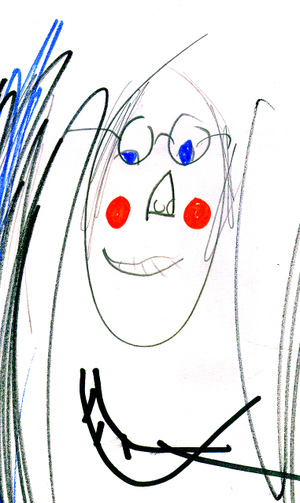 Fri., Sept. 24, 2010, 1:15 pm. Today I revisited the rock in the center of the magical Labyrinth. To some this represents God, to others Wisdom. To most, however, it's just a rock. Another thought came to me on the trail. Why not occasionally leave the "beaten path" and just go off into the woods to really commune with nature, maybe becoming more one with the Universe. I tried it, and it works. Finally, the "Wetlands" is wet! And by the next morning the fallen branches and puddles were gone. Good work, guys! Tues., Oct 5, 2010, 10:00 a.m. The rain continues, with the "Meadow" area impassable without walking through wide-but-shallow puddles. So I got my feet wet. The elevated walkway through the "Wetlands" area carries walkers above roaring streams of water, a welcome change after a summer of baked, cracked earth. The "Woodlands" is, well, just dripping wet but easy to negotiate. I saw a fawn, leaping like a gazelle across the trail and gracefully bounding off into the woods. Others have seen as many a three young or female deer at a time, but never a buck. Wonder where he hides? Thursday, Oct 14, 2010, 3:00 p.m. More and more rain. This time I wandered through with my camera, determined to make it look as wet as it actually was. The photo above is of the "Wetland" sign, the elevated trail, and a flowing rivulet. Yesterday I got a fleeting glimpse of a strange animal as it dashed across the trail. It was solid black, looking like a very large cat, but with a huge, bushy tail. Wonder what that was? Sunday, Oct. 24, 2010, 12:30 p.m. Vandalism! The first act of deliberate vandalism and unlawful behavior that I have ever witnessed at Stony Creek occurred today. Four or five guys in their late teens or early 20s jumped out of a Nissan car with New York plates beginning with the letters FEZ, knocked over the PortaPotty in the parking lot, and ran down the Meadows path, shoving people out of the way while screaming loudly in Spanish. They entered the woods making extremely loud noises and frightening walkers. Fearing a dangerous encounter, I left. If this is allowed to continue there will be no point in having this park. Thurs., Oct. 28, 2010, 2 pm. Fall has finally done its thing, and all the leaves are down. The trail has a certain beauty in this starkness, as I hope I captured in the photo above. This shows the elevated portion in the "Wetlands" portion. Today the park crew was busy removing the fountain in the pond before the pipes freeze. They are also planning to drop the water level in the pond so that when winter comes it will be safe for skaters. Sun., Nov. 21, 2010, 10 a.m. It's amazing how much smaller the park seems without leaves. Now you can clearly see houses, businesses, and even a hotel through the barren branches. Soon it will snow. Wed., Dec. 8, 2010, 10 a.m. Bitter cold, much rain, and heavy winds have made the trail impassable. Much of the "Meadows" area was thin ice with about an inch of water under it. Winds have apparently swept water from the pond into the "Woodland" and "Wetland" areas, eroding the trail and leaving a frozen mess. There was also a large fallen tree trunk laying across the trail. I quickly gave up and went home to dry out my feet. The entire trail area is as dreary as dreary can possibly be dreary. But soon it will snow, bringing new visual pleasure. Saturday, January 1, 2011. It snowed last Sunday and Monday, and even though the temperature is in the high 40s right now, this much is still left. Until now, Life's Little Adventures has focused on rather distant places and exotic happenings, covering periods of time from the mid-1930s until the near past. Now I plan to add more local material, some historical and some contemporary, with an emphasis on Eastern Pennsylvania, especially on Montgomery and Bucks counties. Stay tuned. More coming as I discover them. New York City's latest attraction just opened on June 8, 2009, so naturally I had to give it a try. Imagine an elevated park, 30 feet above street level, winding its way through Lower Manhattan and piercing right through buildings. That's The High Line, and it's quite an accomplishment. UPDATE: On May 4, 2012 I walked the High Line again, from 14th Street to 23rd Street, on my way to the Avedon photo exhibition at the Gagosian Gallery on West 21st Street, practically under the High Line. It's amazing to see just how much this elevated park has been extended and improved, with many snack vendors along the route! A few new photos are added at the bottom of this entry. How did this come about? Its history actually goes all the way back to 1849, when the Hudson River Railroad ran a street-level line to the junction of Chambers and Hudson streets. Its locomotives tended to frighten horses, so each train was preceeded by a man on horseback blowing a horn. As the city grew and motor traffic replaced horses, this became more than a nuisance and a very real safety concern. By the late 1920s congestion had become so bad that it was decided to elevate the rail line, then owned by the New York Central Railroad. This work was completed in the mid-1930s and continued operation until 1980. After that, it was abandoned and slowly reverted to nature. Slated for demolition, the High Line was saved by activist citizens and in 2006 restoration by the city began. A friend and I began our walk at the southern terminus, Gansevoort Street at Washington Street, in the heart of the historic Meatpacking District and next door to the new (2015) Whitney Museum of American Art. We got there from Penn Station via the 8th Avenue subway to 14th Street, then walked three blocks to the southwest. The line south of here had previously been demolished. Here, a stairway (photo, above) leads up to the park with its magnificent views across the Hudson River to Hoboken, New Jersey. The map above shows both the currently opened section, from Gansevoort Street north to 20th Street, and the section north of that to 30th Street which should open next year. Another section, from 30th Street northwest by the Penn Station Rail Yards is under negotiation with its owners, the CSX railroad. Leaving Gansevoort Street (photo, above), we climbed the stairway (there are also elevators at 14th and 16th streets) some thirty feet to the linear park. From here a paved pedestrian walkway leads north to the end, bordered on the sides by remnants of the abandoned rail line. Between the tracks grow flowers, plants, and even trees (photo, right). Volunteer gardeners were busy at work making it even more attractive. Oddly, the High Line passes through several buildings along the way. Most of these were once industrial structures and warehouses, with rail sidings leading in at the third-floor level. Some of them have recently been converted into highly desirable loft apartments, and others into art galleries. At 15th Street the trail cuts through the old Chelsea Market Building, formerly a Nabisco factory. Beyond this is the Northern Spur, where a side track went into a meat warehouse. It is now a horticultural preserve. The High Line crosses Tenth Avenue around 17th Street, and a section of the structure has been lowered in steps to form a viewing platform looking out across the midtown skyline. A glass wall prevents those carried away by the view from falling off and tumbling down to the streets below. Plans are afoot to build a grand staircase at 18th Street, leading down to a public plaza. Above this, a cantilevered snackbar will hover above the site. Strolling through the Chelsea Grasslands leads to the present northern terminus at 20th Street. Beyond this, the High Line is still under development and should open in 2010. Another friend, reached by cell phone, joined us nearby. From here it is only a short walk across Eleventh Avenue to the famous Chelsea Piers. Built in the early 1900s to accomodate ocean liners, the piers have a colorful history. This was the destination in 1912 of the Titanic, which of course sank on its maiden voyage, and it was here that its 706 survivors arrived aboard the RMS Carpathia. Three years later the RMS Lusitania (photo, right) sailed from these piers on its fateful journey to England. It was torpedoed by the German Navy off the coast of Ireland with great loss of life, an event that hastened America's entry into World War I. In the mid-1930s passenger ships were moved north to new, larger piers around 50th Street, and the Chelsea Piers reduced to cargo handling as well as World War II troop ships. Nearly demolished in the early 1990s, they were saved by the abandonment of the Westway Project, and now form a major sports and entertainment complex. We ended our day of exploring the High Line and Chelsea Piers by visiting a few of the sports facilities spread over 28 acres above the Hudson River. Among the many activities available are gymnastics, soccer, basketball, rock climbing, a golf driving range, health club, and more. But after shooting a few hoops my companions agreed with me that a visit to the Chelsea Brewing Company at the southern end of the complex was in order. There we had sandwiches and a variety of craft beers brewed on the spot before returning to Penn Station for the train ride home. Quite by accident back in 1975 I stumbled upon a fascinating and endlessly enjoyable travel guide entitled Turn Left at the Pub — and it changed my life. At that time I was bored and looking for something new to do, something to do with travel, and possibly something to do with making travel movies for cable TV. I had already made some films of our adventures in Japan, Australia, Tahiti, and all over Europe while on photo assignments for Pan Am, and had done a particularly nice one while sailing the Greek Islands with some friends. These were mostly shot with a Nikon Super 8 camera, and some with a Kodak Ektasound camera. In search of inspiration I visited a travel bookstore on New York’s Madison Avenue around 35th Street, looking for unusual guides to offbeat places. One practically screamed out to me. This was Turn Left At The Pub: 22 Walking Tours Through The British Countryside by George W. Oakes, first published in 1968 and revised in 1974 (and revised again in 1998). It described, in step-by-step detail, a series of 24 one-day walking tours in England, mostly to unusual destinations not covered in conventional guides. My cup of tea exactly, as I love to walk and love poking around in strange places. So I equipped myself with a used pro-level Beaulieu Super 8 camera with a huge zoom lens, and a high-quality Sony tape recorder for “wild” sound capture. Then I took off for a month’s stay in Britain, installing myself in a cheap hotel in London’s Kensington district. My first destination was to Sevenoaks, easily reached by rail from London’s Charing Cross Station in some 40 minutes. From there it was a stroll of about a mile to one of Britain’s grandest stately homes, the 15th-century Knole House (old Illustration, left). Built on the site of an earlier mansion, it is called a "calendar house" owing to its having 365 rooms, 52 staircases, 14 entrances, and 7 courtyards. Originally home to the Archbishop of Canterbury, it was seized by King Henry VIII in 1538. Twenty-eight years later, Queen Elizabeth I gave it to her cousin Thomas Sackville, whose descendants have lived there ever since. One of these, the writer Vita Sackville-West, wrote the definitive guide to the place in 1922. Her friend Virginia Woolf answered with Orlando, an acclaimed 1928 novel based on the house and its family. Inside the house are treasures of 17th-century royal furniture, along with paintings by Van Dyck, Gainsborough, and Reynolds, plus magnificent copies of the Raphael Cartoons. However, the splendid interior tour was nothing compared to the joyful country walk that followed. It was nearly six miles to the next destination, but what bliss! First, I passed a cricket pitch, then stables, slaughterhouses, breweries, workshops, and other estate outbuildings. A narrow road continued uphill, affording a wonderful view of Knole House before crossing a golf course. Herds of deer grazed here, and there was a pond and a farm house. Chestnut Walk led through woods to Bitchet Green, then a public footpath went through an orchard and followed a small stream past oast houses. I now arrived at Ightham Mote (photo, below), a 14th-century fortified manor house so well preserved that to step inside is to find yourself back in the Middlle Ages. It is surrounded by a defensive moat and iron gates. At the time of my visit the place was still considered to be haunted by the ghost of a woman whose skeleton was — according to the story — found bricked up inside a wall of the banqueting hall. This has since been pretty well disproved, but the whole house still has a ghostly feel about it. Outside, white swans presented by the Queen glide across ponds fed by a waterfall next to woods. A walk of under a mile took me to the hamlet of Ivy Hatch, where I relaxed over a pint or so at a colorful pub called The Plough. After that, a short walk ended at a main road at which I got a bus ride back to Sevenoaks, then a train to London. All in all, a glorious day of exploration and healthy excercise. The movie project never did work out as I found it to be much more than I could handle, but the experience itself started me on a new career as a travel writer, really changing my life in profound ways. Here's another sample chapter from my new guidebook, Daytrips Austria. This one-day adventure from Salzburg will be especially welcome on a hot summer day as it takes you deeply underground into a fantasy world of eternally frozen ice. The Eisriesenwelt cave system, whose name literally means "World of the Ice Giants," is one of the strangest sights in Austria. This is actually the largest complex of caves in Europe, with over 25 miles of interconnecting caverns explored so far. Perched some 5,460 feet above sea level and 3,280 feet above the valley floor, it is a short 28 miles south of Salzburg. Nearly the first mile of the caves is perpetually frozen into a wonderland of fantastic ice formations, some of which may date from the last Ice Age. Eisriesenwelt is indeed regarded as the greatest ice cave in the world, whose proximity to Salzburg has long made it a popular — if chilly — daytrip destination. The ice is formed as a result of unique ventilation conditions in the cave. During the winter months cold winds cause the water trickling down from the plateau above to freeze. In summer, the flow of air is reversed, so that the warm air does not enter, hence the caves remain eternally frozen. Even on hot summer days, the inside temperature is always below freezing. An additional attraction is Burg Hohenwerfen, a dramatically-situated fortress with falconry shows and medieval dungeons. Trains of all classes depart Salzburg's main station (Hauptbahnhof) fairly frequently in the morning for the under-one-hour ride to Werfen. Return service operates until mid-evening. By Car, take the A-10 Tauern Autobahn to the Werfen exit, then highway B-159 into Werfen. It is possible to drive up to the parking lot near the lower station of the cable car, thus avoiding a taxi or bus ride. The cave is closed between late October and the end of April, while the fortress has a slightly longer season. Be sure to bring warm clothes, sturdy shoes, and possibly gloves as you will be spending over an hour at freezing temperatures. Photography or videotaping is forbidden as it disrupts the tour presentation. This trip should not be taken by claustrophobic or physically handicapped persons and is not suitable for very young children. An early start is recommended. 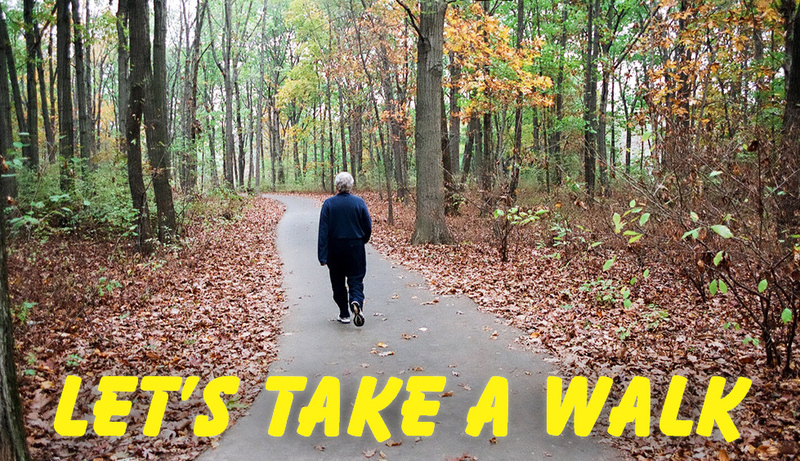 A few miles of outdoor walking are involved, so if it looks like rain bring an umbrella. You will be supplied with a lantern to find your way underground. For further information, contact the Werfen Tourist Office at Markt 24 in Werfen, T: (06468) 5388, W: werfen.at or eisriesenwelt.at. From the Werfen Train Station (1) it is only a short walk across the river to Werfen's main square(Markt) (2), where you can board a minibus that takes you to a parking lot halfway up the mountain. Be sure to arrange for a return ride at the same time. It is also possible to board this at the train station instead, but there are fewer departures. Those with cars can drive to the parking lot, bearing in mind that the road is quite steep and somewhat difficult to negotiate. You could also hike the distance, about four miles with a 1,200-foot climb if you're up to it, but in that case plan on taking a late train back. However you get to the parking lot (3) you now walk for 15 minutes along a beauitiful path to the lower station(Seilbahn Talstation) (4) of the cable car, where refreshments are available. Purchase a combination ticket (Kombinierter Tarif) that includes the cave tour, and board the cable car for a very steep 5-minute ascent to the upper station. Adjacent to the upper station(Bergstation) is the Dr.-Oedl-Haus (5), a rustic Alpine retreat with good, inexpensive meals and cheap overnight accommodations. This is where you are assembled into groups for the cave tour. *EISRIESENWELT ICE CAVES (6), T: (06468) 5291, W: eisriesenwelt.atOpen May 1 until late Oct., tours daily from 9:30-3:30. Allow 3-4 hours for total trip. Combination ticket for cable car and cave tour: Adults €€€, children to 14 years €€. The groups leave more or less hourly for the 15-minute uphill walk to the cave entrance (Höhleneingang). There they are met by a guide and outfitted with lanterns as there is no lighting in the caves other than an occasional magnesium flare used by the guide to highlight certain features. When the door is opened, there is a tremendous gush of cold air as you fight your way into the large underground hall; then a sudden stillness. Steps lead from the entrance hall to the enormous Posselt-Halle, named after the person who first entered it in 1879. You then climb up the Grosser Eiswall (big ice wall) that runs across the entire width of the cave. The first man to overcome this barrier and thus be able to explore the miles of caves beyond was Alexander von Mork, who accomplished this feat in 1913 along with two companions. Beyond the ice wall a long, narrow corridor leads into the magnificent Hymir Halle with its fantastic ice formations such as the Schloss Hymir and the Ice Organ. You are then led through the Thrym Halle and up a drafty air passage to the shimmering frozen curtains of the Ice Gateway, followed by the *Alexander von Mork Cathedral, the largest chamber in the cave. A white marble urn in a recess there contains the ashes of von Mork, who perished in World War I. The Ice Palace lies beyond this, a half-mile from the entrance and as far into the caves as the tour goes before beginning the downhill journey to the entrance. Spelunkers might be interested in arranging for a private tour extending much farther into the subterranean labyrinth. BURG HOHENWERFEN (7), T: (06468) 7603-4, W: salzburg-burgen.at. Open April, Tues.-Sun. 9:30-4:30; May-June and Sept., daily 9-5; July-Aug., daily 9-6; Oct.-Nov., daily 9:30-4:30. Falconry shows at 11 and 3. €€. Elevator to castle €. First built in 1077 to guard the valley approach to Salzburg, this mighty fortress was destroyed in a peasant uprising in 1525 and reconstrucyed to its present form later in the 16th century. Several falconry shows are presented daily against a backdrop of towering mountains. The tour includes visits to a special exhibition, a falconry museum, a chapel, an arsenal, and — of course — the dungeons. Two more nearby underground adventures in Austria are at Hallein and Hallstatt. NOTE: Although written 27 years ago, most of the information here is probably valid — still, if you intend to take this Little Adventure yourself you should check with the local tourist office first. I have deleted information regarding taking this daytrip from Munich, which was completely out of date. UPDATE: I have recently redone this trip for my new guidebook Daytrips Austria. See details at bottom of page. NEW UPDATE, June 2011. Owners of Apple's iPad, iPhone, and iPodTouch can now take all of the latest information along with them for this and other Austrian delights. Details at bottom of page. Now Also for Android devices. The photos are in glorious Black & White because that's what I needed back then. I tried to add a little sepia to enhance them. "Glorious mountains are what the Tirol is all about, and it is to them that you should head for a wonderful odyssey into this remarkable land. This daytrip from Innsbruck is a relatively easy ramble across a fantastic landscape far above the cares of the ordinary world, winding up in the splendid old village of Hall. Along the way you will pass some of the sites of the 1964 and 1976 Winter Olympics, ride a cable car to the top of a mountain, walk for over two hours along a gentle path with spectacular vistas, have lunch at a rustic alpine inn, descend on a chairlift, stroll through unspoiled countryside, cross the Inn River on a wooden covered bridge and, finally, explore one of the most charming little towns that Austria has to offer. If you love the out-of-doors but have been a bit hesitant about just marching off into the Alps by yourself, this pleasant excursion may well be the most memorable highlight of your visit to the Tirol." "From Innsbruck, begin at the main train station (Hauptbahnhof) (1) about 9 a.m. and follow the directions in THE TRIP section below." "A clear, warm day between June and mid-October is essential for enjoyment of this trip. Since you will be walking at an altitude of nearly seven thousand feet, you can expect it to be a great deal cooler along the trail than it was in Innsbruck. You may, in fact, encounter a little leftover snow, even in August. This trip may be taken any day of the week, although the cable car can be a bit crowded on Sundays." "Expect to find generous portions of inexpensive mountain type food at either of the alpine inns (4) and (5) near the end of your first walk. By this I mean meals of the pea soup, sausage, and beer variety; delicious and filling after the hike, but simply served in a rustic atmosphere.."
"At day's end, in the picturesque village of Hall, there are several nice outdoor cafés at which to relax before returning to Innsbruck." "A jacket or sweater is absolutely necessary on this trip, even if it is 90 degrees in the shade in Innsbruck. You won't be sorry if you bring both. A folding umbrella could be helpful should the weather change. 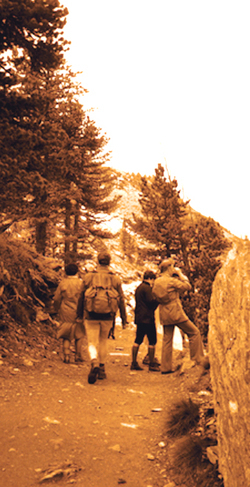 Comfortable walking shoes are also required, although mountain boots are not necessary as the trail is well surfaced." "From the front of Innsbruck's main train station (Hauptbahnhof) (1) take the "J" line bus, which departs every half-hour on the half and full hour, to the lower station of the Patscherkofel Cable Car (2) just above the resort village of Igls." "You will pass various Olympic installations along the way, notably the ice stadium and ski jumps. Although this route may seem short on the map, it is very steep and not really suitable for walking. Once there, purchase a one-way ticket to the top of the mountain and board the large cable car. As it ascends the mountain keep a lookout on the left for the spectacular Olympic bobsled run. Just beyond this, at Heiligwasser, you disembark and change to another cable car, which takes you to the Patscherkofel Berghotel (3), the starting point of our walk." 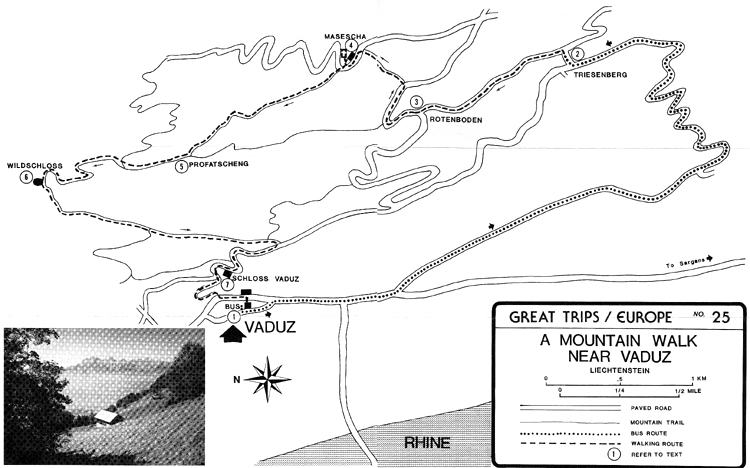 "Leaving the terrace of the hotel, at an altitude of 6,435 feet, follow the footpath marked Zirbenweg to the left in the direction of Tulfeinalm and Glungezer Hütte. This section of the trail is identified as Path #32, although the number changes later. The total walk to our first destination, Tulfeinalm (4), will take a little over two hours. Distances on alpine trails are commonly marked in terms of time rather than linear measurement; thus 2½ Std. (Stunde) refers to hours, not kilometers. A good walker will probably do better than the indicated time." "The relatively level trail continues along the ridge of a high mountain with glorious panoramic vistas up and down the Inn Valley. 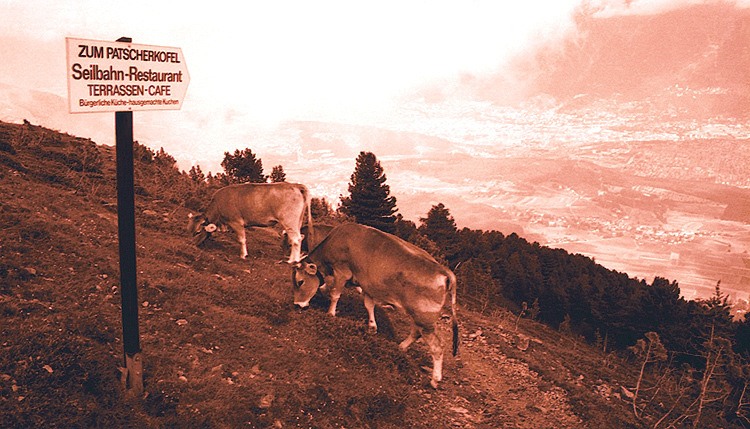 Cows and goats, their clanging bells filling the air with music, can be seen grazing alongside the path. 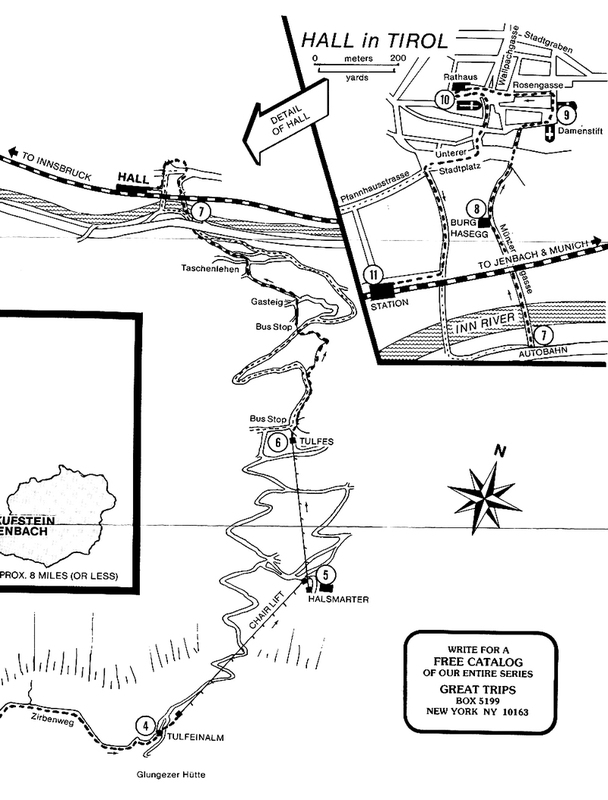 Presently you will reach a fork at which Path #32 is marked for Meissner Haus. Rather than take this, remain on the Zirbenweg, which bears left and is shown as Path #48. Gradually the trail enters a lovely pine forest still sheltering — in shaded spots — patches of last winter's snow, even in the height of summer." "All along the walk you will meet other hikers who, if they are Austrian (as most are), will greet you with a friendly Grüss Gott, meaning "good day" in the local dialect. Just smile and try to repeat the phrase back to them." "Still in the forest, a branch trail leads off to both sides. Avoid the one marked to Glungezer Hütte and stay with the Zirbenweg, following the signs to Tulfeinalm. From here on, the trail no longer has a number, Path #48 having turned down the mountain. Soon it crosses the tiny Lavierenbach brook. The first leg of our trip is almost over now. In only a few hundred yards you will come to the Tulfeinalm (4) where a rustic climber's hut offers hearty food at very reasonable prices. You can either eat here or at another similar place halfway down the mountain." "On a small mound a few yards from the hut is the upper station of the Glungezer Sesselbahn. Buy a one-way ticket to Tulfes, seat yourself as gracefully as possible on the moving chairlift, and descend to the midway station, Halsmarter (5). The ride is surprisingly enjoyable and not in the least bit scary. Still, if you don't care for chairlifts, there is a dirt road paralleling it all the way down, which can easily be walked. Getting off at Halsmater, you will find another hut with good food and, delightfully, an outdoor café at which to relax and enjoy the sun-filled view." 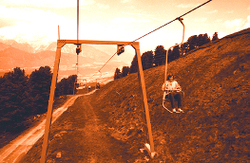 "Continue on the second stage of the chairlift all the way to Tulfes (6). 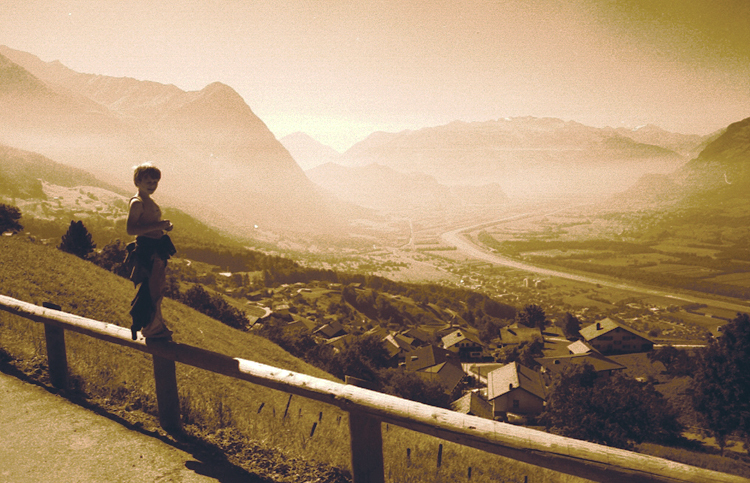 In the center of that village there is a bus stop (Haltstelle) from which you can get a ride to Hall-in-Tirol. A schedule is posted at the chairlift station. It is, however, far more interesting to walk the few miles. Follow the road downhill and, just before the first big bend to the left, turn right onto a path marked Fussweg nach Hall. This trail will again cross the main road. If you are really worn out by now take the paved road to the right. Otherwise, continue on the path, which goes a bit uphill, then down to the river. " "Along the way the trail sometimes becomes a dirt road, even paved at points, goes through farms, forests, and crosses a fence. The first tiny settlement is called Gasteig. At the next one, Taschenlehen, be on the lookout for a path with a well-hidden sign marked for Hall. This is just before a short row of houses. It will lead you down under the Autobahn and onto a covered wooden bridge (7) crossing the Inn River." "Emerging at the far end of this unusual span, you are now at Hall-in-Tirol, sometimes known as Solbad Hall, our final destination and one of the loveliest towns in Austria. 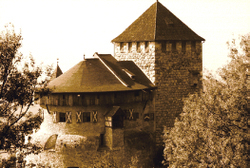 Continue straight ahead on the Münzergasse to Burg Hasegg, an old castle from the Middle Ages. Opposite it, on the left, is the Münzerturm (8). Built around 1450, this brick tower has housed the Ducal Mint since 1477 and may be visited. It was here that the early Taler coins, forerunner of our dollars, were struck. In those days Hall was a very wealthy place, its prosperity derived from the salt mines and river navigation. 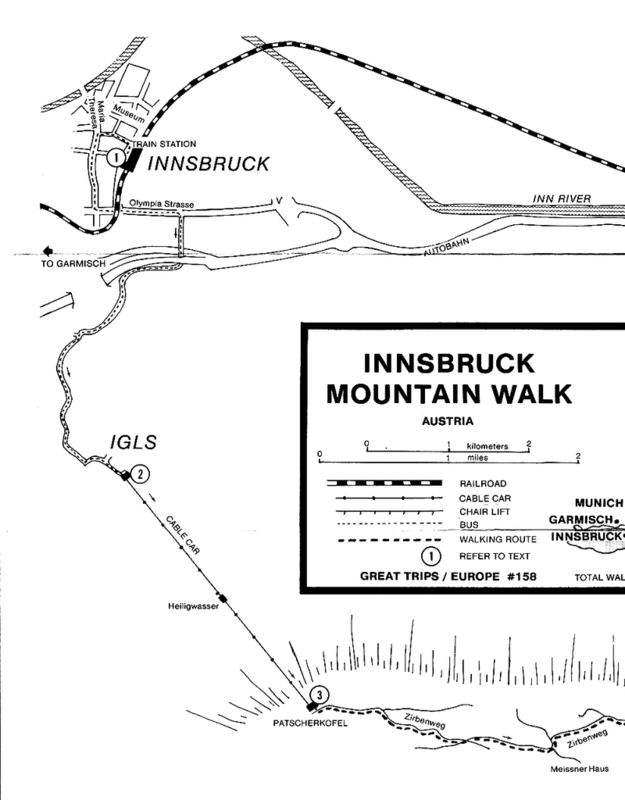 It was also a notorious pleasure center for those wishing to escape the rigid life of Innsbruck." "A short stroll beyond will take you to Unterer Stadtplatz. From here the Schweighofstiege steps lead to Eugenstrasse, at which you turn right to the Damenstift (9), a ladies' abbey founded in 1567. Walk through the Stiftsplatz and make a left onto Rosengasse. Just a few steps farther and you are in the marvelously picturesque Oberer Stadtplatz (10), a scene right out of a child's fairytale. The 13th-century parish church of St. Nikolaus, which dominates the square, is a visual fantasy. Opposite it is the 16th-century Town Hall (Rathaus), in front of which there is most conveniently placed an outdoor café, the perfect spot at which to end you day's ramblings." "After exploring some of the narrow alleyways radiating from this gorgeous spot, head down the Langer Graben at the rear of the church and return to Unterer Stadtplatz. From here you can, if you wish, get a bus for the very short trip back to Innsbruck. If you would rather take the train, or if you are returning directly to Munich, follow the map to the train station (Bahnhof) (11), just a few blocks away." Copyright © 1980 by Earl Steinbicker. Please remember that this was written 27 years ago, before I was taught how to write by the editors at Hastings House. I apologize for any bad grammar and especially for the excessive use of adjectives. Some of the facts have no doubt changed over the years, so check first if you intend to take this daytrip yourself. This trip and many others like it have been fully updated and placed in my brand-new guidebook, Daytrips Austria. For some free sample chapters from that and other similar guides, CLICK HERE. INNSBRUCK and the ALPS, my new app for the iPad, iPhone, and iPodTouch, is loaded with the latest travel information and has plenty of maps and photos, all accessible without WiFi or cellular connections. The temporary introductory price is only U.S.$2.99 - and that includes free updates! CLICK HERE on iTunes for more information. An Android version is available at Google's App Store. CLICK HERE for the whole Great Trips / Europe story. CLICK HERE for Mountains Index. Some other mountain adventures in Austria on this blog are: Ascent of the Hafelekar (from Innsbruck), Kitzbühel (also from Innsbruck), Eisriensenwelt (from Salzburg), and Schneeberg (from Vienna).